Spring time is my favourite season in California. The weather is great (15 to 20 degrees celsius), the dungeness crabs are in season in the north (e.g. 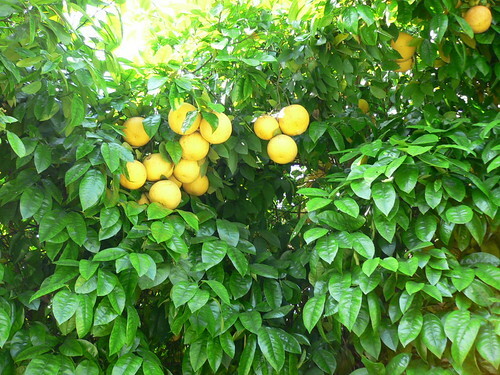 San Francisco) and the orange and lemon trees in fruiting splendour, down south (e.g. Los Angeles, San Diego, etc). I travel to the US regularly around this time of the year and I would always make it a point to stay over at my uncle's place for a few days. 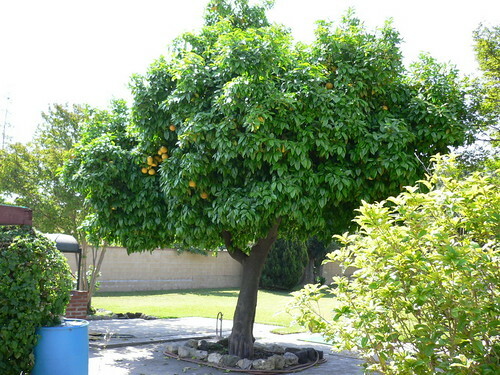 Like clockwork, I would check out the orange tree at the backyard, the moment I arrived as I am always curious to see how the orange tree is doing each year. Well, the report card for this year... hmm... not so good. The tree was bare when I last visited in February and I thought fruiting was delayed as February was unusually wet this year. Well, here I am again looking at the tree and I think perhaps next year would be a better harvest. Oui? Non? On a good year, the tree would have been more orange then green and the branches strained to hold all the extra weight of the fruits. Ahh... the gang of oranges all relak one corner in the shade. 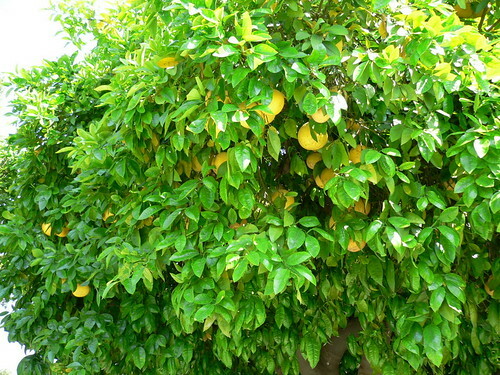 Let us not forget to appreciate the lush green leaves that compliments the cluster of oranges. Ahh... mother nature, thou art most beautiful! While they may not be as pretty as the Sunkist/Jaffa oranges that we find in the supermarkets, but boy, they sure are si beh tua liap. D-Cup runneth over? No? 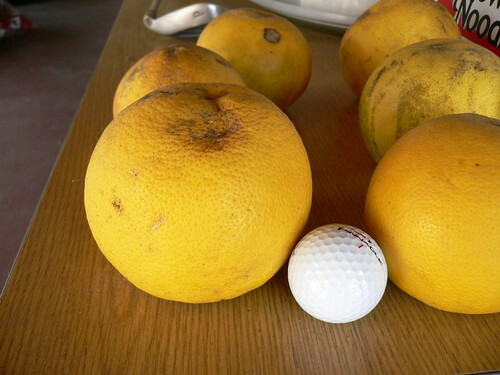 Looks like the neighbour's lemon tree is doing a much better job this year. So jealous! 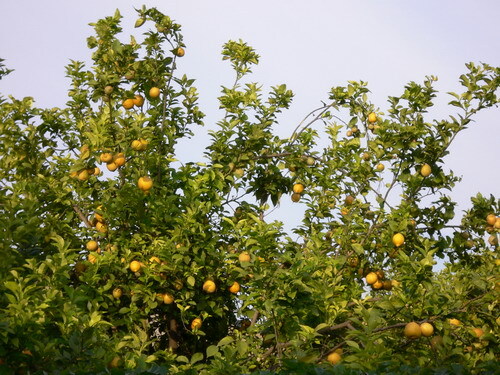 Hmm... speaking of lemon tree, maybe I should change this week's tune to Lemon Tree..... NOT! D? favourite...lots of juices in those fruits. =D..
... ouch... bad joke... ouch. Looks like pomelo. So biiiiig! I missed California and the nice weather! *Sob* Wish I can go back there. Anna: Eh? Somehow I am under the impression that you are in California? Hmm.... what made me think that? ?